If you require advanced tooth replacement, then you’ll be pleased to hear that our Manly West family dentist also provides dental implant therapy. Thanks to our visiting Prosthodontist, the entire treatment is completed right here in our practice, including everything from surgical implant placement to custom crown, bridge and denture restoration. There’s no need to be referred to an off-site specialist, saving you additional time and costs. Our all-inclusive implant treatments are designed to mimic natural teeth, including their form and function, making dental implant therapy the perfect option for replacing missing teeth. The process of surgically fitting an implant is relatively simple. The first step involves placing the titanium root into your jaw, before allowing a period of around four months to encourage new bone to grow and fuse with it (known as osseointegration). Once this has occurred, we can go ahead and attach your fixed crown, bridge or denture. In some cases when a problematic tooth has been extracted, we are able to fit a dental implant within the same day. When this happens, we cover the dental implant with a temporary crown to prevent discomfort or concerns as the area heals. Then, just 3-4 months later, we are able to attach the permanent crown. 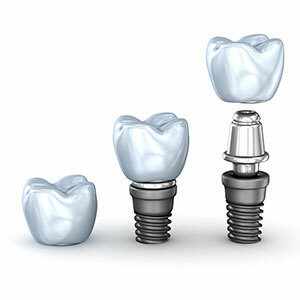 Did you know implants can also support your dentures? Implant supported overdentures are a more comfortable and durable alternative to conventional ‘plates’, while both upper and lower dentures can easily be secured in place using just 2-4 dental implants. While some dental methods rely on materials such as pastes or adhesives to keep the denture in position, implants provide a more trust-worthy and robust solution. For patients who dislike the idea of a removable appliance, we also provide permanent implant dentures. These are also hand-crafted in our company’s lab, allowing us to deliver exceptionally precise results that you’ll love. Some people believe that you need a titanium root fitted for each missing tooth, however this is simply not the case. Dental implants are so strong and long-lasting, we can actually use them in pairs to support fixed bridges. This calls for fewer implants! Do you have a missing tooth that needs replacing? Book a consultation with us today to see if dental implants are the right choice for you.